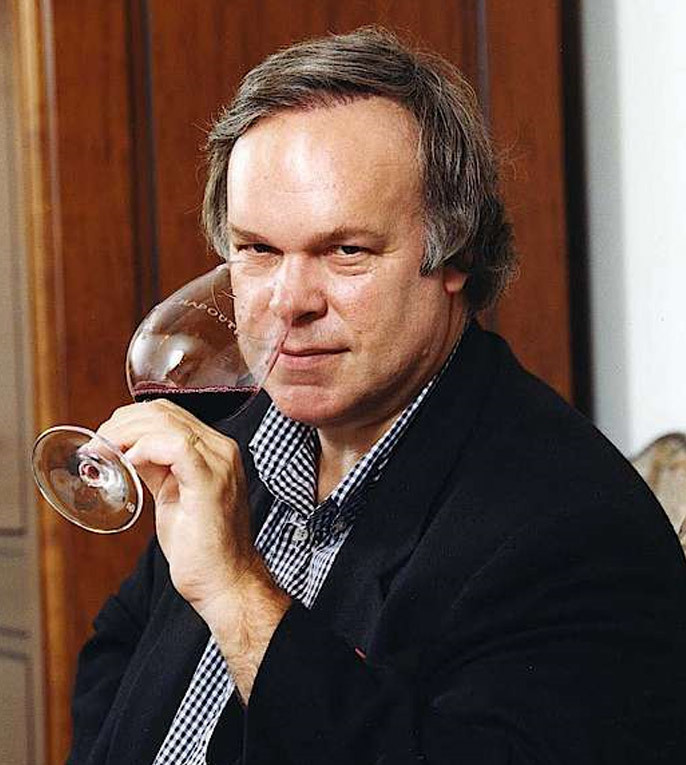 Baltimore-based lawyer Robert McDowell Parker jr. (* 1947) is the most influential wine journalist and wine critic of the world. At the end of the 1970s, the at that time unknown in the wine world disempowered the then leading British wine journalists. His nose is supposedly insured for one million dollars, which is why he is also called "The Million Dollar Nose" or "Wine Pope". For the wine review Parker led the usual in the US schools 100-point system which then became the international standard due to its rapidly increasing influence. According to his own goals, he wanted to be "a consumer advocate" who, in contrast to many wine writers at that time, was in no way in the market wine trade was connected and thus had no conflicts of interest. Parker first received worldwide attention when he considered the 1982 Bordeaux to be outstanding vintage exclaimed. This was completely contrary to the opinion of many other industry peers, who said the year was far too acidic. There was an endless debate as to whether or not 1982 was an age-resistant year. Since a wine during the aging or the bottle aging Parker continues to change or refine it does not leave it in a one-time evaluation, but leads by city standards again tastings by. The latest vintage is rated "en Primeur" in the April issue with a range of points (for example 92 to 96 points), these are Parker's "first thouhgts" (first thoughts). One year later, Parker rates the vintage again "prior to bottling" and then with the appearance of the wines on the market once more "from the bottle". In addition, it may well be the case that in the evaluation of a wine older vintages of the same wine are mentioned and evaluated once more. A summary of the Wine Advocate reviews is provided in the "Parker's Wine Buyer's Guide". This appears at irregular intervals, until now in the years 1987, 1989, 1993, 1995, 1999, 2002 and 2007. On average, about 8,000 wines are valued, including very few German and even less Austrian (tendency is increasing). Parker's particular interest is clearly French wines, over which he wrote several successful books. "Bordeaux" was published in 1985, "The Wine of the Rhône Valley and Provence" in 1987 and "Burgundy" in 1990. Parker regularly tasted more than 100 wines a day during his most active time, which was later reduced by expanding his team. In the period 1978 to 2010 there were a total of about 300,000 wines tasted by the team. Only about 160 of them got the highest rating with 100 points. It is a phenomenon that well-rated wines increase significantly in price immediately after the rating is announced. His critics chalk him up for his low-acid, fruity wines ( fruit bombs ) or wines with high alcohol content and pronounced tannins prefer. Parker himself denies this. Anyway, this led to the fact that not a few wineries changed their techniques in the vineyard and cellar to the "Parker style". This phenomenon is called parkerizing designated. Parker's reviews are therefore not undisputed, but it is fact that he has positively influenced the wine world. The 2004 documentary "Mondovino" by American filmmaker Jonathan Nossiter shows the effects of the globalization, In it Robert Parker and his friend advisor Michel Rolland (* 1947) as the diabolical protagonists of a worldwide Weinuniformierung ( Coca-Cola wines ), which in the opinion of experts is not justified. Of course, he has not been able to taste the innumerable wines personally for many years alone, but uses the help of employees who are responsible for specific countries or regions. Of course, there are often personnel changes. At the end of 2014, the crew consisted of Jeb Dunnuck, Luis Gutierrez, Monica Larner, Neal Martin, Lisa Perrotti-Brown, Stephan Reinhardt, David Schildknecht and Mark Squires. Parker himself has reserved himself for Bordeaux and Northern California. Previously active for Parker were among others Antonio Galloni, Jay Miller, Daniel Thomases and Pierre Rovani. Parker received many honors and awards for his achievements in wine ratings. In 1992 he received the Order "Chevalier de l'Ordre du Mérite National". One year later he received the "Wine and Vine Communication Award" from Moët Hennessy ( LVMH ) for its French editions on Burgundy and Bordeaux. In 1995 he became honorary citizen of the viticulture community Châteauneuf-du-Pape in the Rhone Valley. The absolute highlight was the decree signed in 1999 by the French President Jacques Chirac (* 1932), which made Parker a Knight of the Legion of Honor. This page was last modified at 30 November 2017 at 08:37.